What a difference a year can make. As we look back at what was 2018 for the FVMBA and the trails in the Fraser Valley, it tells a story of how far we can go in just one year! Please take a moment to read the following message from our Board President, Rocky Blondin; followed by a summary of our accomplishments in the key “A, B, C’s” of what the FVMBA exists to achieve: Advocacy, Builder Support & Community. What a year 2018 was, and what a year 2019 is shaping up to be. When reflecting on the year that was, all of my thoughts end up landing with the people and their stories. Everything we do is fueled by a person or group of people – most of them volunteers – and those stories are always the ones that continue to amaze me. 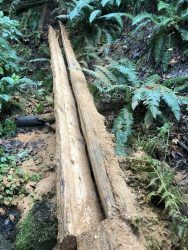 From our Board of Directors, who do the various tasks needed to keep this train on the rails, to our race committee that puts together the Vedder Mountain Classic, to the various regional leaders that organize all the events we host (trail days, social rides and more) and to our volunteer trail builders, without whom we have no reason to do what we do. I stop there to save the space on the page (and your time reading this), but there are many, many more to acknowledge. This list of people is massive, and growing, and that fact is what gets me most excited. Each time we ask for help, more people are putting up their hands. We need all the help we can get and we’re not always the best at putting it to good use – but we’re getting better – and we’re putting more resources behind putting those offers of help to good use which will make it easier for everyone to contribute in the best way they know how. I would like to list all the people that went above and beyond this year, but there are literally too many to list. You all are doing such good things and the community is infinitely better for your work. So thank you all. However, if I may, I am going to take a quick second (and some liberty with Presidential privilege 🙂 ) to acknowledge someone (well 3 people) that I am inspired by and super proud of. My wife, Cheryl, and my two sons, Cohen and Landry. They support me when I stay up late to write messages like this, etc, but this year they did something that made me more proud than I could imagine – they created, organized and operated the Bear Cub Kids race, putting another amazing group of volunteers together to put smiles on over 50 young MTB’ers. And now they are making plans for the next one in 2019. 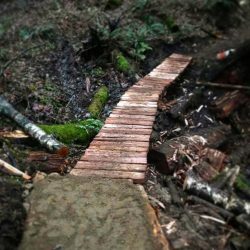 For them to step into the MTB community and add something like that blew me away. Thanks you three. 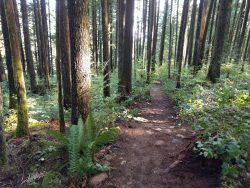 To all our sponsors, donors, volunteers, staff, contractors, community partners and stakeholders, I want to express my sincere gratitude for the effort you output in order to make the trails and our community great in the Fraser Valley. We are a lucky bunch to have each other, and this organization to all get together under and do good things. As always, I am also grateful to those that came before us to set this stage – we stand on big shoulders. Thank you as well. We finished 2017 with the SaveSumas campaign, and early in 2018, we learned that the campaign was a success. 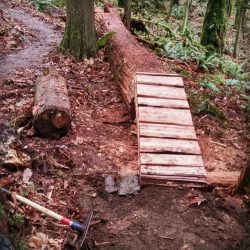 Sumas was saved from this project and the trails will live to ride another day! 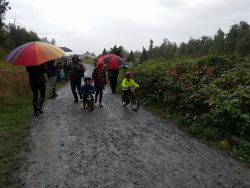 It was a great showcase of the community of people that love the trails and has opened up new partnerships and opportunities with the Abby Trail Running Club, the City of Abbotsford, the Sumas First Nation and other stakeholders as well. Some really good things have come out of this initiative. Board Member (Mark Sawatzky) and Abbotsford Area Rep (Chris Friesen) took Abbotsford City Councillors: Dave Loewen (on Thursday July 19, 2018) and Patricia Ross and Les Barkman (on September 20, 2018) up to Sumas Mountain for a tour of the mountain and the trails. This was a great opportunity to showcase our trails that our builders have built and maintained, and talk about our challenges and our dreams for the mountain, and how the City and FVMBA could work together for the future of Sumas. 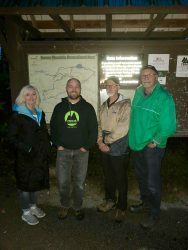 We are excited that these City Councillors enjoyed their time on the mountain and since then they have become stronger advocates for the FVMBA and for Sumas Mountain. Further West we expanded our ‘reach;’ this included taking on the advocacy work at Thornhill in Maple Ridge. 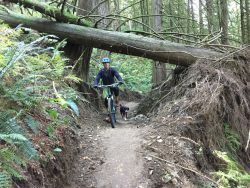 FVMBA hosted two town hall meetings – the first to get the trail builders on-side with what the club offers, and second to have a conversation with the riding public and other trail users to discuss the concerns and also solutions to user conflict challenges. This all amounts to the trails at Thorn getting a unified voice under the banner of the club. 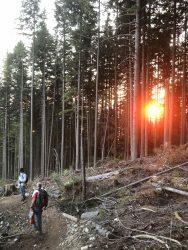 At the second meeting, a cadre of 8 new volunteers put up their hand to start working on trail advocacy in Maple Ridge. Much more news to come in 2019 in Maple Ridge. 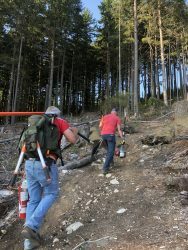 Further East FVMBA worked with groups of riders from three areas: Hope, Harrison, and District of Kent, advising them on establishing trails in these areas. In discussing the prospects with local municipalities, we discovered that their support for new trails in these areas is strong. FVMBA will continue to meet and work with local riders and municipal staff to plan and build MTB trails in these areas in 2019. The FVMBA was also invited as guests to the opening of the Syéxw Chó:leqw Adventure Park by the Aboriginal Youth Mountain Bike Project. 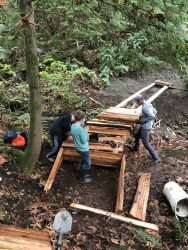 We were amazed to see what they have been up to out near Agassiz – another exciting project that works on building community and building trails. We were honored to be invited to be a part of their efforts. That project was lead by the AYMBP as noted, and our club has partnered with them to host several Aboriginal Engagement workshops to enable our Board and key partners to learn about how we can be good partners with local First Nations in the region and build strong relationships. The first session was an eye-opener for us all and we are keen to put those lessons to work in 2019 and beyond. We continue to have a great amount of work to do in respecting the rights and title of the First Nations where our trails exist. On the trail front, it was relatively business as-usual. 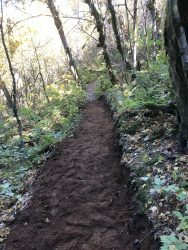 We have seen an increase in volunteer builders doing the trail fairy magic which is exciting to see. 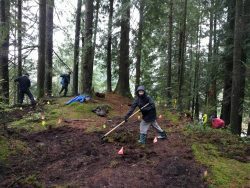 A part of this was our ability to host IMBA Canada doing trail clinics on three separate occasions, as well as guiding construction of a bike skills park in Mission. 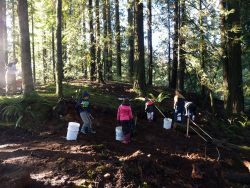 They have proven a great asset and ally in developing our collective knowledge of trail building, maintenance and assessment. We have plans to do more clinics and other sessions in 2019. The trails saw several trail days in each region and this resulted in many great trails in great condition for all to enjoy. FVMBA partnered with the FVRD on the ETF project. You can learn about that effort and what all the acronyms mean here. 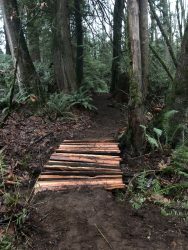 The short version – new (and restored), machine-built (and hand-built) trails starting near Rolley Lake and leading into the network at the Woodlot. 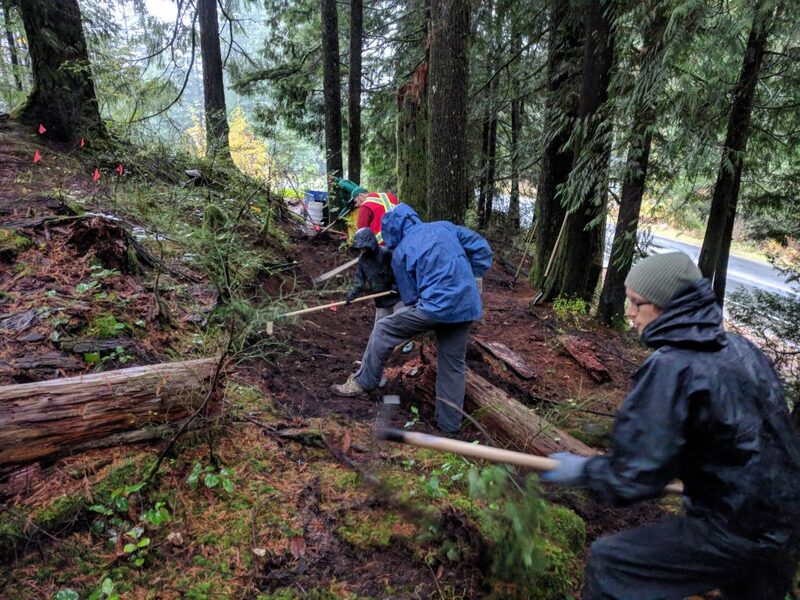 As well, FVMBA partnered with the District of Mission and IMBA Canada to start work on a new, beginner bike skills park at Mill Pond (Bear & Red Mtns). This project is being funded by the District’s Toursim dept., being supported with staff and equipment by Parks & Recreation, and being augmented with a new parking area north of Mill Pond at the bottom of Mastodon/Aruum access road. A true community effort as the skills park’s construction is volunteer fueled. Keep your eyes out for a couple more build days early in 2019 to see this to completion. 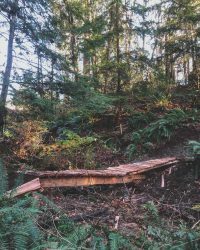 2018 was also a big year for the Chilliwack Community Forest. 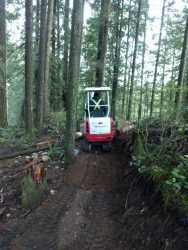 The Chilliwack Park Society and volunteers worked tirelessly to open 4 new trails: Fireline, Spotlem, Slug, and Thaletel. 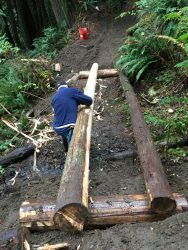 On Vedder FVMBA builders were able to to replace the bridge at the bottom of Terd Ferg and spent a lot of time buffing up the trails in preparation for the Vedder Mountain Classic and Fraser Valley round of the Canadian Enduro series. 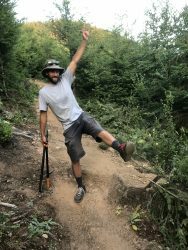 The Vedder Mountain Classic brought over 257 racers from across the Pacific Northwest and places beyond for a good time on the trails; for a full recap check out this link and keep your eyes peeled to https://www.veddermountainclassic.com/ as registration will be opening soon for the 2019 race. Vedder Mountain then played host to Fraser Valley edition of the Canadian Enduro series, which was held on the Sunday after the classic, and 300 racers participated in this event. 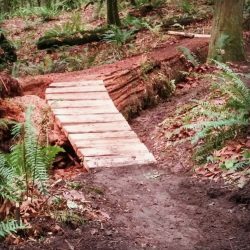 In the fall we finally completed the rebuild of the first bridge on Ditch Chicken. 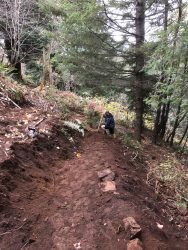 Special thanks to Kerry Frayne and Patrick Podolski from Golden Dirt Trails for hammering this one out before the snow started flying. Our thematic goal for 2019 is to build bridges. Both literally and figuratively. There are some green monsters out there that are due for maintenance and/or replacement. And we want to continue to build bridges with our volunteers, our community partners, and First Nations. 2018 saw the launch of the FVMBA Social Ride series. This series was open to members to come out, meet their fellow MTB enthusiasts and ride bikes. While that sounds like a simple concept, it wouldn’t have gone anywhere without key volunteers in each community putting together the necessary plans to make them a success. Hat tip to Dan Schubert, Amanda Porslid, Ernie Kliever and Mike Woods who all took the lead in their respective regions to pull these events together. 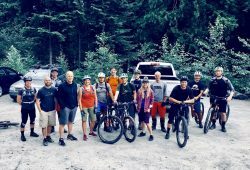 They were also fueled by good, volunteer ride leads/sweeps and in Chilliwack, volunteers to coordinate and execute a small Fiver race series to boot! Speaking of racing, the Vedder Mountain Classic is the FVMBA’s signature event, and this year was no exception. 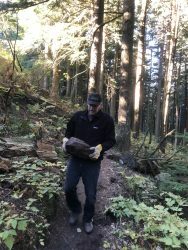 The Vedder Mountain Classic brought over 257 racers from across the Pacific Northwest and places beyond for a good time on the trails; for a full recap check out this link and keep your eyes peeled to https://www.veddermountainclassic.com/ as registration will be opening soon for the 2019 race. Vedder Mountain then played host to Fraser Valley edition of the Canadian Enduro series, which was held on the Sunday after the classic, and 300 racers participated in this event. 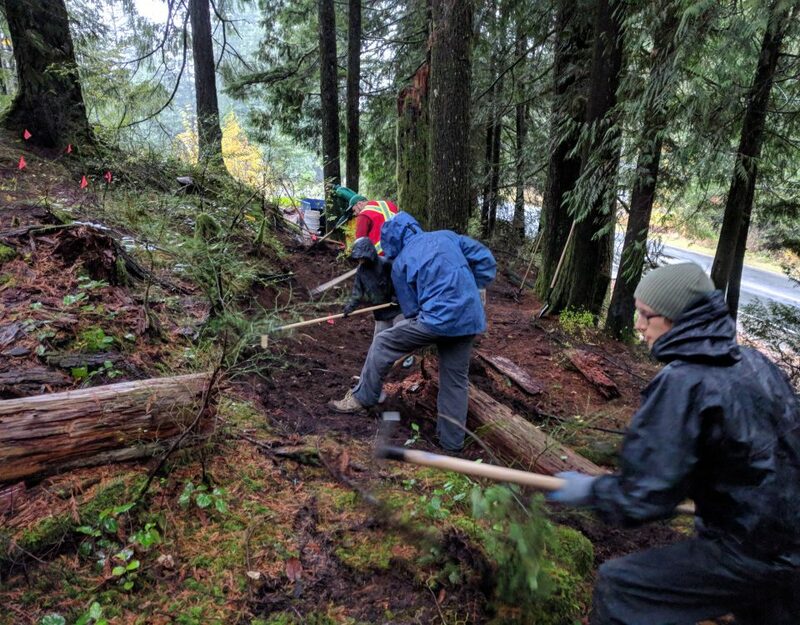 The club’s excited that the proceeds from this weekend-long event are set to continue to go directly back into trail projects in and around Chilliwack. One of which was the recent bridge replacement on Ditch Chicken. Another first, and also in racing – the Bear Cub Kids Classic went off at Heritage Park in Mission. In September, over 50 brave youngsters braved torrential rain to race one of three courses – beginner (run-bike friendly), intermediate and advanced where they can put their skills to the test against their riding peers. It was all smiles and the biggest question asked was “when is the next one?”. We’ll be putting those plans together early in 2019 so stay tuned. Our team was happy to share the message of our Vision and Mission from our strategic planning in 2017, and through that and the events listed above, our membership grew to over 900 people! 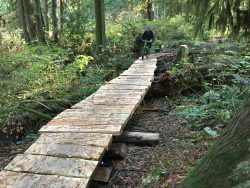 That is a huge feat, but still just a fraction of the thousands of riders that enjoy the trails in the Fraser Valley. Trailforks tells us so! The numbers there show 1,129 unique riders in the entire region. However, we have done trail studies that show us Trailforks ridership numbers typically represent 6-12% of the total riding public. So that 1,129 extrapolates to 9,408 to 18,816 riders! While that range is quite broad, it shows us that 900 is a modest membership and our goal for 2019 is ever higher. 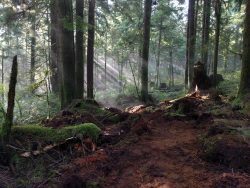 We want to get buy-in from all 10,000+ mountain bikers in the Fraser Valley. Also new this past year was a big increase in donations and sponsorships from the community. Our annual supporter – Roger Friesen and UFV – gave us the largest donation ever from the Banff Film Festival in Mission. We also signed our first Platinum Sponsor – Diverse Properties. We’re very grateful for all of our sponsors and donors. 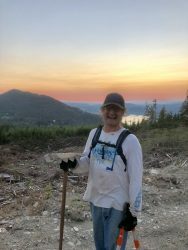 Vedder Mountain Bike Co. leading the donor list in 2018! But every dollar counts and is put to very good use. Note: an informal social will follow at Moxies. Please RSVP to [email protected] and let us know if you can make it to the AGM (only), or the AGM + the social. Happy Trails and Happy New Year! From Your FVMBA team.